Since the arrival of the printed books in mid-March and dealing with the logistics of sending them out to people from over 25 countries around the world, life has been somewhat exciting. The comments on the book’s quality have been very gratifying after these months of very hard work. Thank you again for all your support in spreading the word. If you don’t have it, this is what the cover looks like. Click it to buy! And as the book wings its way around the world, I’ve received fine comments from Tokyo, Netherlands, Boston, Australia, California, Ireland and many points in-between. Enough trumpet blowing, there is only left to say that just in time I sneaked in an entry to this year’s Louis Roederer Writers Awards so here’s hoping the judges like it every bit as much. Following a signing baptism in Gevingey in the Jura for the well-worth-visiting organic wine fair Le Nez dans le Vert, my signing skills are now warmed up and I’m looking forward to doing more, especially in English! Several French visitors bought the book, but it was also wonderful to meet so many worldwide fans of Jura wines who had made their way especially to attend this show, and to see their pleasure at being able to delve deeper into what makes these wines what they are. The wines that I found time to taste from the 30 organic producers at the tasting were ever-better than in previous years. The only worry is the small quantity of wine available and the fact that the vines this year are so far in advance that everyone is now scared of possible spring frost creating a catastrophic 3rd small vintage in a row. Surely this can’t happen? The organisers of the Real Wine Fair have offered me a table at which I can sell the books, shared with the publishers of the innovative magazine Noble Rot (by chance, edition #4 will feature the Jura). I will offer the books for 10% off the usual price, so at £22.50 for payment by cash or UK cheque only. If you already have a book, please feel free to bring it along for me to sign. The London Marathon streams nearby on Sunday but don’t let this prevent you from coming to taste a huge selection of mainly organic wines from around the world. There will of course be one or two interesting Jura wines, kindly provided by Doug of Caves de Pyrène, available to taste on our table, so please come by. I will also be conducting a seminar and tasting of five Jura wines at 3.30pm on Monday afternoon. Together with the new Geneva-based wine club Wiine.Me I will be selling the books and offering around five wines to taste during a convivial evening. The event will take place at Le Comptoir wine bar from 7pm. Contact me for more details. There will be 20 producers present for the Jura trade tasting at Chandos House. I will be conducting an introductory seminar as last year at 11.30am and at 3pm with seven wines (essential to book). At 1pm we will be raising a glass of Crémant to celebrate the book and I very much hope that some key players who helped with the book will be with me. Contact Mandarin Communications to RSVP. I shall be giving a presentation and tasting for the prestigious Wine and Food Association of the Netherlands after their annual Grand Prix Saint Hubert tasting competition, which celebrates its 30th anniversary this year. Books will be available for sale and signing there. The following day, three key Jura wine importers join together for a small trade tasting of Jura wines in Amsterdam, where I will also be present and giving a presentation. For more information, contact Olivier Schutte of de Geluksdruif. The best place to buy the book for international delivery is on my website Wine Travel Media (but be patient, it may take one or two weeks for delivery depending where you are) – sold at the cover price (plus a small extra for shipping outside Europe), if you buy here this particularly helps support my hard work. Contact me directly for trade purchases of five or more copies. If you prefer to buy through Amazon, it is currently only on Amazon.co.uk through Marketplace but that is for delivery internationally too – please add a review there if you can. If anyone can recommend a good distributor based in the USA I would be interested in contacting them. 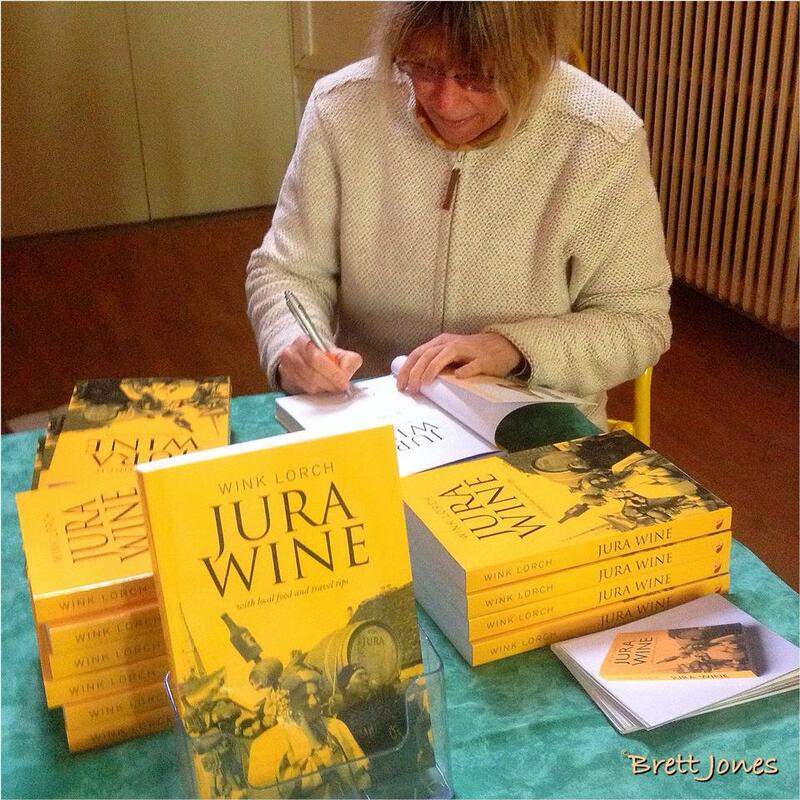 In the Jura wine region the book is now available through local book shops and tourist offices which will attract a wider audience, I hope. 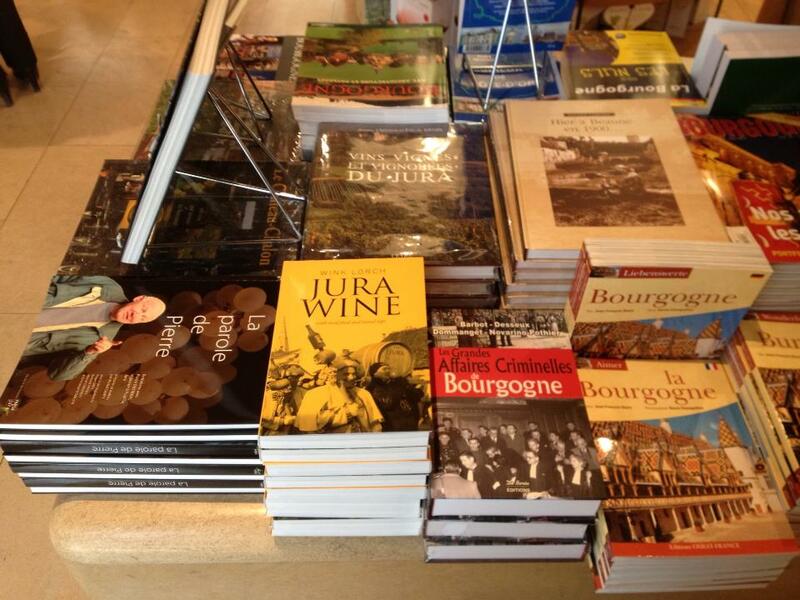 And in Beaune it is stocked at the amazing wine book shop Athenaeum, opposite the Hospice. If you are a writer or blogger who doesn’t already have the book and wants to review it, please contact me to discuss. And finally, whilst at Le Nez dans le Vert, my long-standing sommelier friend Christophe Menozzi, now at the Château de Germigny came by to see me and joined me for a TV interview for local French TV. You can see the TV clip (in French) here.